An isolated case of Late blight has been confirmed in Southern New Jersey on a farm that was growing both field-grown and greenhouse-grown tomatoes. The pathogen originated in an old tomato planting that had been unsprayed since the last pick over 6 weeks ago. 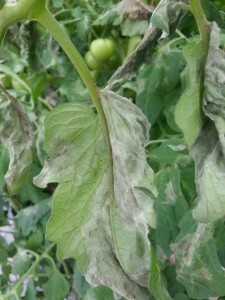 Left unscouted, the field developed Late blight and the pathogen moved into the greenhouse operation within days of an otherwise healthy-looking greenhouse tomato crop. As a reminder any crop, conventional or organic, left standing in a field after last harvest will only act to serve as a source of potential incoculum for many diseases. As with tomatoes and other crops, all should be disced down, tilled, and/or mowed down as soon as possible after harvest. Conventionally, applying the herbicide, gramoxone, is also an easy way to achieve this. Organic growers need to be just as diligent and disc down, till, or pull old plantings soon after use. For more on the control of Late blight in tomato please see the 2013 Commercial Vegetable Production Recommendations Guide. 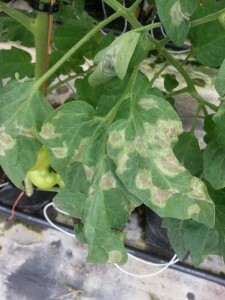 Late blight lesions developing on a greenhouse grown tomato plant. Under dryer, less humid conditions the lesions may not have the characterstic dark, greasy appearance. Late blight sporulating on the underside of an infected tomato leaf. Note the pure white sporangia (spores) on the underside of the leaf.